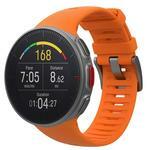 POLAR VANTAGE V :: Train like a pro with the Polar Vantage V multisport performance GPS watch. Measure the power you produce while next gen optical heart rate technology lets you accelerate the effectiveness of your training. Display the metrics, affects, and recovery of every workout with an awesome waterproof color touch screen.